Your monthly Social Security retirement benefit is based on your lifetime earnings. 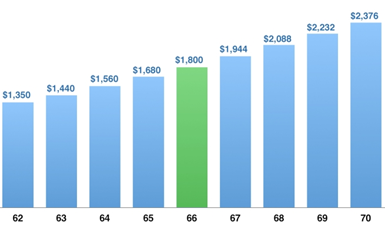 Your base benefit--the amount you'll receive at full retirement age--is calculated using a formula that takes into account your 35 highest earnings years. Alternatively, if you postpone filing for benefits past your full retirement age, you'll earn delayed retirement credits for each month you wait, up until age 70. Delayed retirement credits will increase the amount you receive by about 8% per year if you were born in 1943 or later. Should you begin receiving Social Security benefits early, or wait until full retirement age or even longer? If you absolutely need the money right away, your decision is clear-cut; otherwise, there's no ''right" answer. But take time to make an informed, well-reasoned decision. Consider factors such as how much retirement income you'll need, your life expectancy, how your spouse or survivors might be affected, whether you plan to work after you start receiving benefits, and how your income taxes might be affected. (Member FINRA/SIPC) and SEC Registered Investment Advisor. Products offered through CFS: are not NCUA/NCUSIF or otherwise federally insured, are not guarantees or obligations of the credit union, and may involve investment risk including possible loss of principal. Investment Representatives are registered through CFS. Redwood Credit Union has contracted with CFS to make non-deposit investment products and services available to credit union Members.